ESA's ExoMars mission has gone through several phases of planning with various proposals for landers, orbiters, launch vehicles, and international cooperation planning. The programme includes several spacecraft elements to be sent to Mars on two launches. 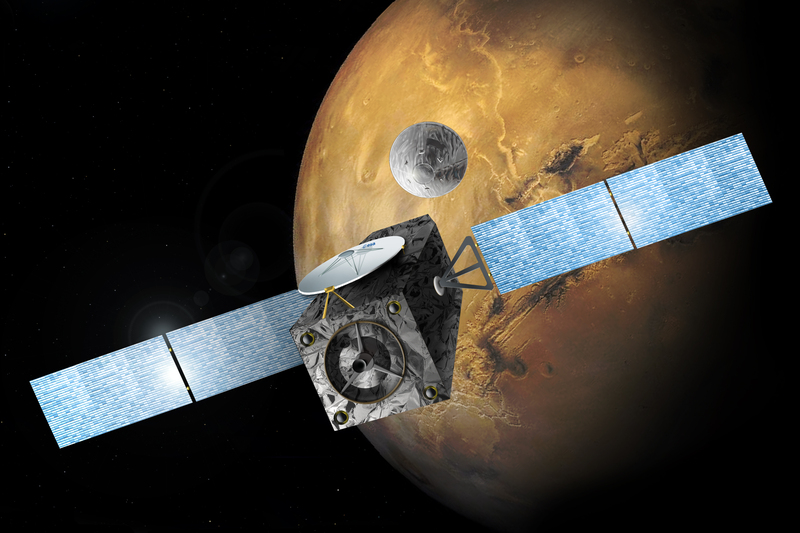 The first mission of the ExoMars programme, scheduled to arrive at Mars in 2016, consists of a Trace Gas Orbiter plus an Entry, Descent and Landing Demonstrator Module (EDM). It launched at 14 March 2016 on a Russian Proton rocket. Three days before reaching the atmosphere of Mars, the EDM will be ejected from the Orbiter towards the Mars. The ExoMars Orbiter will be inserted into an elliptical orbit around Mars and then sweep through the atmosphere to finally settle into a circular, ~ 400-km altitude orbit ready to conduct its scientific mission. 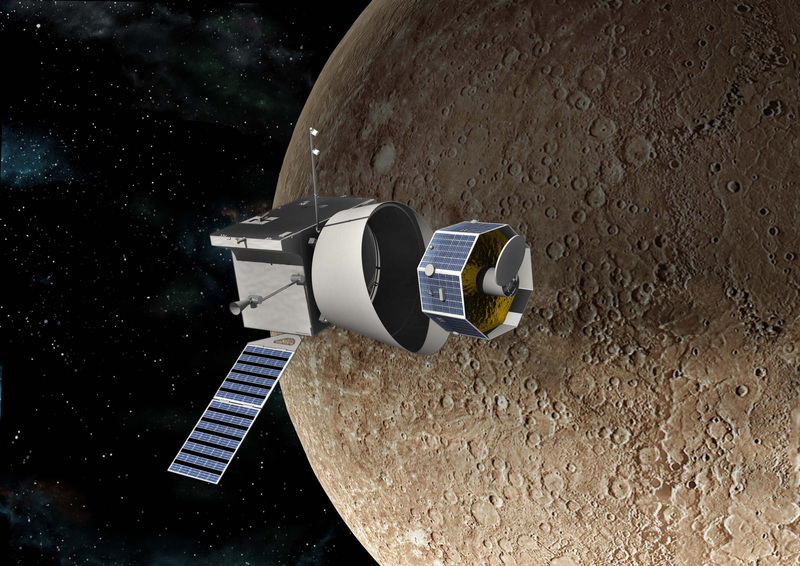 The Orbiter spacecraft is designed by ESA, while Roscosmos provides the launch vehicle. A scientific payload with instruments from Russia and Europe will be accommodated on the Orbiter to achieve its scientific objectives. 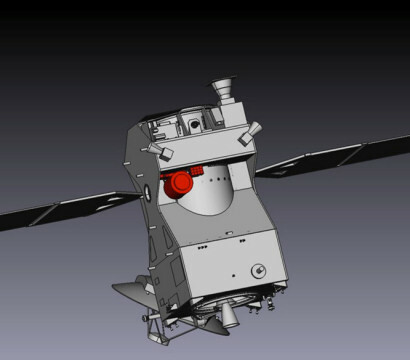 The Colour and Stereo Surface Imaging System (CaSSIS) will be part of the instrument payload on the ExoMars and will be located on the Mars-surface-facing side of the orbiter. The researchers of Planetary Imaging Group from Bern University have developed the hardware of the Imaging System. The orbiter science payload will be primarily nadir pointing to keep the Martian surface in constant view. The orbiter will rotate about an axis that will maintain its solar panels oriented towards the Sun while avoiding solar illumination of its thermal radiators. 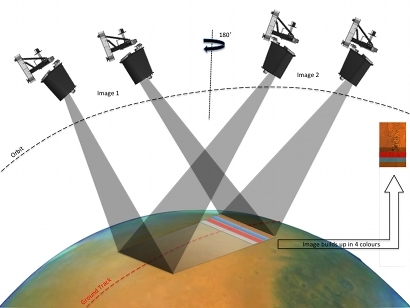 CaSSIS can compensate for the spacecraft's yaw rotation using a drive mechanism, but during nominal stereoscopic imaging the orbiter will pause its yaw-rotation to maximise the paired-image accuracy. The rotation mechanism will be able to turn the entire telescope system by 180° while its support structure remains fixed. This rotation system will also enable the camera to acquire stereo images with only one telescope and focal plane assembly. A stereo image pair will be acquired by first rotating the telescope to point 10° ahead of the spacecraft track to acquire the first image, then rotating it 180° to point 10° behind for the second stereo image. Optimal correlation of the stereo signals will be ensured as there will be identical illumination conditions every time a stereo image pair is acquired. Engineers of SGF Co. Ltd. designed the onboard software of Colour and Stereo Surface Imaging System for ESA's ExoMars. The test procedures have finised succesfully, with software version 0.14, and CaSSIS was delivered to Cannes for ExoMars spacecraft integration.